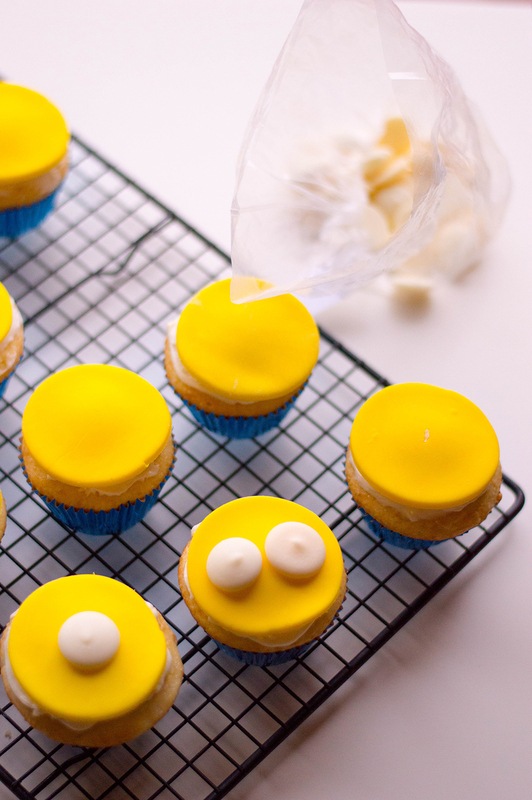 Guests will love these adorable (and easy to make) Minion Cupcakes at your Despicable Me theme party! My kids absolutely love the Minions and all of their crazy antics and humor – and by the movies being so popular, so do many other kids! A Minion party or Despicable Me theme is oh so popular for birthday parties too! I love a kids birthday party with a good theme and usually let me kids choose what they would like to do – some of our past themes have included LEGO Batman, a Fall Festival, Super Heroes and Princesses, Earth Day, and Football! Each of our kids’ birthday party themes has been a blast and let the kids express their personalities! 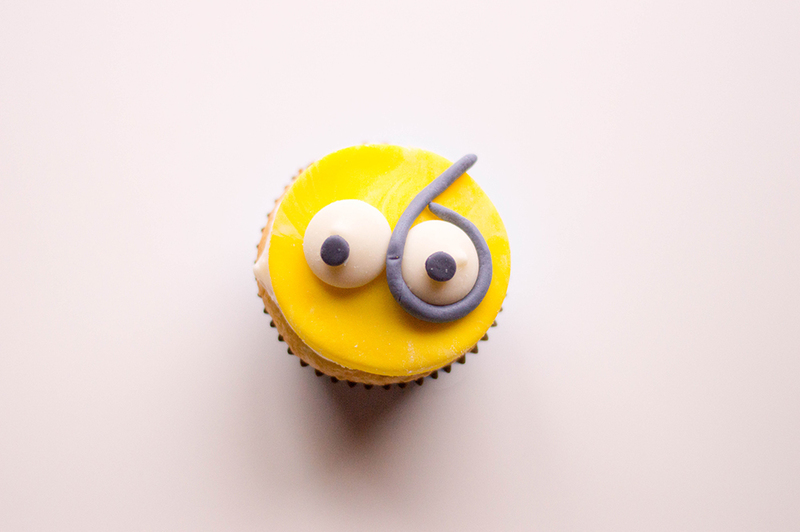 Minion Cupcakes are the perfect addition to a minion themed birthday party – and easy to make too! I always love to keep my party decorations, games and desserts easy to make so that I’m not super stressed the day of the party trying to get everything done. 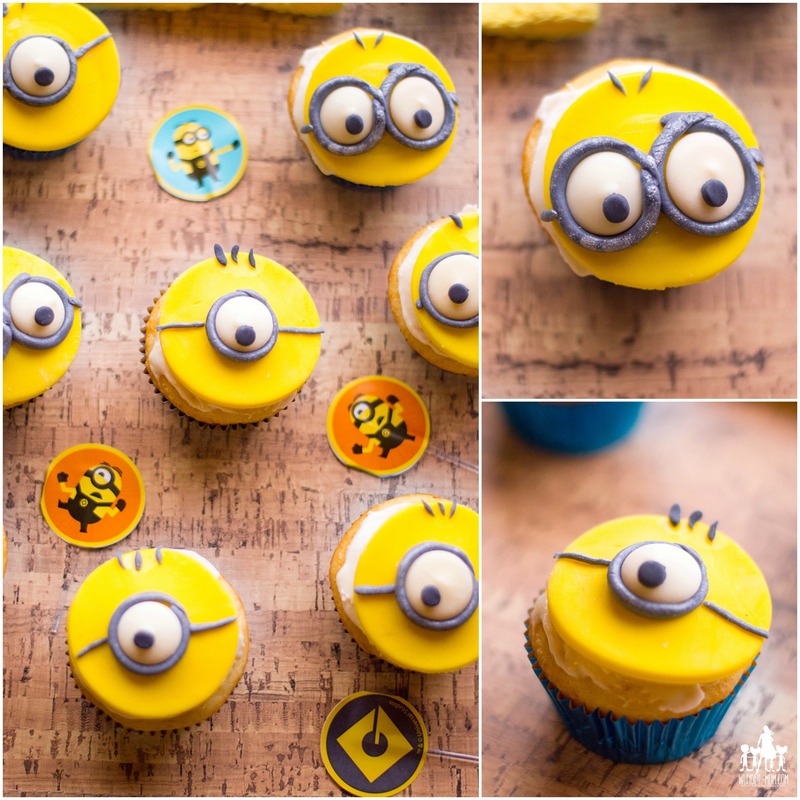 These minion cupcakes are no exception and the kids will LOVE them! What I especially love about these minion cupcakes is how easy they are to make but look like they come straight from the bakery! Perfect way to wow your guests with a fun dessert for a minion party. Line a baking sheet with wax paper. Add 4-5 drops of yellow food coloring on 7 oz. of your white fondant. Fold until fondant is completely yellow. 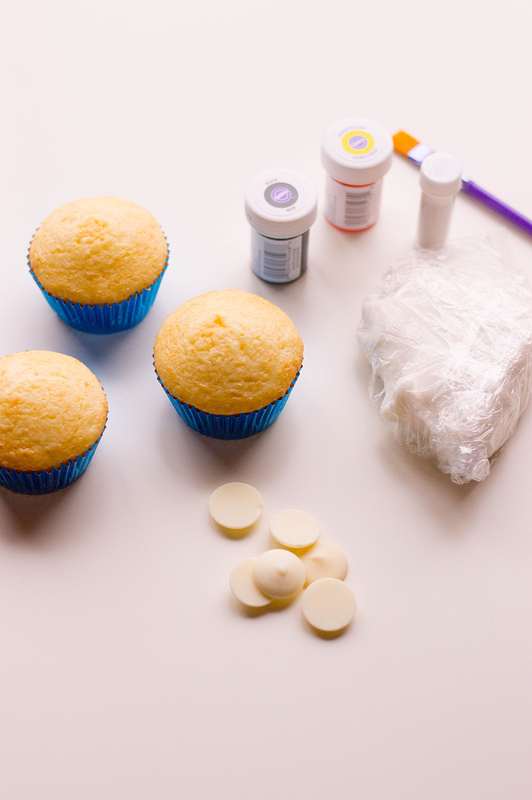 On a working surface lightly dusted with cornstarch, roll out your fondant so that it’s ¼ of an inch thick. Using a cookie cutter, cut out circular shapes so that it can easily cover the top of each cupcake. Place on the lined baking sheet. Dab 4 oz. of your white fondant with a little bit of black gel food coloring (2 small drops) and fold until the fondant is grey in color. Shape them into long strips (you’ll need 20 of them) and place on your lined baking sheet. Color 1 oz. of your white fondant with more black gel food coloring so that the fondant turns completely black (you can add your grey fondant if you have any leftover from the strips). Cut into small circles and place on lined baking sheet. Cut the remaining into ultra-fine pieces (these will act as the Minions’ hair). 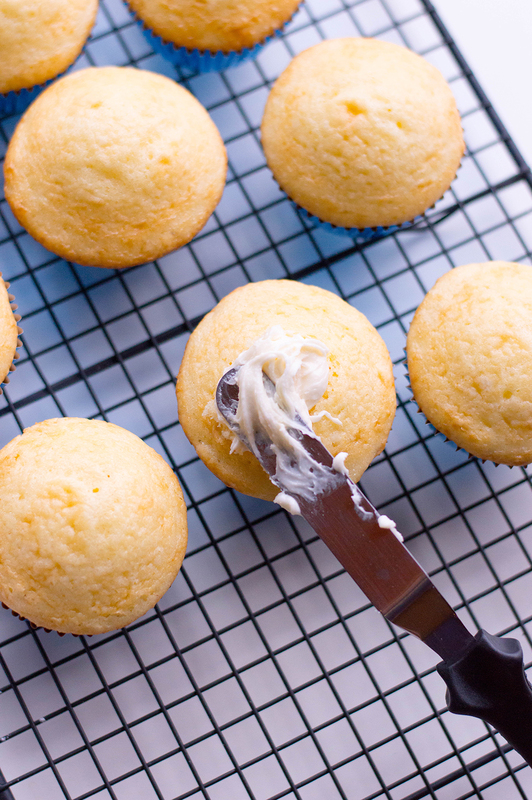 For the icing, use an electric mixer to beat the butter, sugar, vanilla, and milk on high. You’ll want your buttercream to form stiff peaks. Add confectioners’ sugar to stiffen it up or milk to loosen it. Remember, if you’re adding extra of either ingredient, only add one tablespoon at a time. Using an offset spatula, frost each of your cupcakes and carefully place the circular yellow fondant pieces on each one. 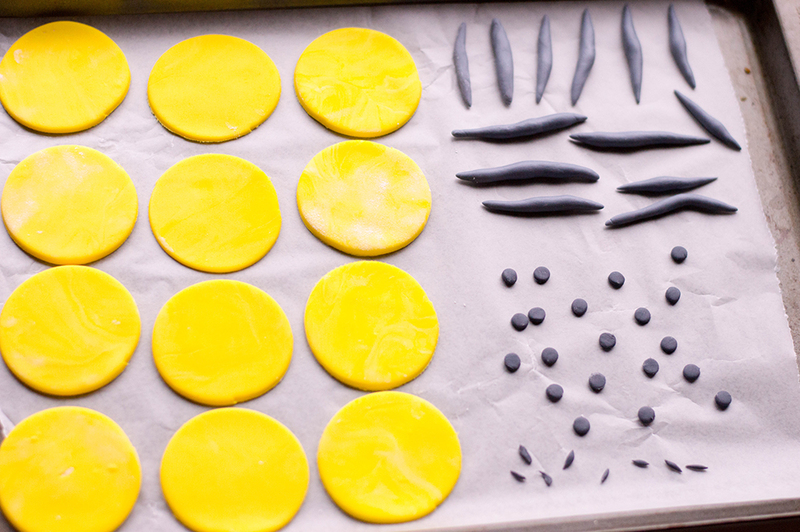 Using a toothpick, frost the back of each candy melt and place in the center of your yellow fondant. These will act as part of your Minions’ eyes. Alternate between putting one eye and two eyes on each Minion. Using a toothpick, dot some buttercream on the back of your black fondant circles. Add to the center of each white candy melt. Brush some water on the back of your grey fondant pieces (this will help them stick) and place around the eyes. They will act as your Minions’ goggles! Add sides to their goggles by adding a small piece on either side of their eyes. Brush on silver food luster to the grey fondant. Brush some water on the top of your Minions’ heads. Add small black fondant pieces – now your little Minions’ have hair! Enjoy!